CLICK HERE TO ACCESS THE EARRINGS AND MANY BRAND NEW ITEMS AVAILABLE TODAY!! WOW …..these are some of the most boo-tiful earrings I've ever done for more than one reason. SECOND…..they are absolutely as light as a feather on your ears!! This is a hard quality to find in a longer pair of earrings !! You will hardly know you are wearing them, yet they are waterproof and sturdy, created in polymer clay and shiny resin. 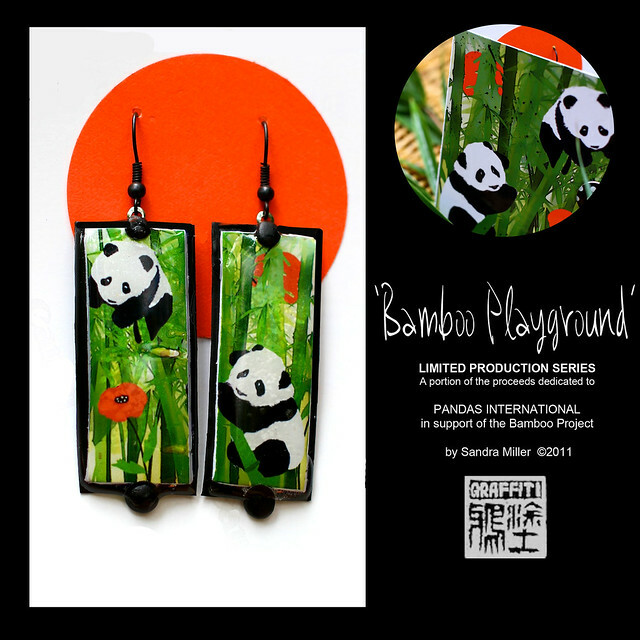 I started with a square artwork I designed specifically to be cut in half to display one perfect panda in the bamboo, on each earring. A duo of coordinating pandas known as a diptych. The long slender shape of the earrings is reminiscent of a Chinese wall scroll. They frame the face sooooo beautifully. I need to get a model to wear these for me to photograph to show you what a knockout wearable art statement these are! The ear wires are black enameled French hooks which really kick up the artsy vibe a notch. If you prefer silver surgical steel I can change them out. Just let me know! WHAT??? YOU DON'T WEAR EARRINGS (wish I could) JUST SAY THE WORD…and I will convert this pair of earrings into TWO wonderful pendants at no extra charge!!!! Black micro ball chains are available in my store at an additional cost of 4.95 each and ship free when shipped with this set. Use as a FRIENDSHIP pendant by keeping one for yourself and giving the other as a gift to your bestie!!. Nearly all of the things you point out happens to be astonishingly precise and it makes me ponder the reason why I had not looked at this in this light before. This piece really did turn the light on for me as far as this particular topic goes. But there is one particular factor I am not necessarily too cozy with and while I attempt to reconcile that with the actual main theme of your issue, allow me observe just what the rest of the subscribers have to say,Very well done.